Petite® Nasturtium leaves are small in size, averaging 7-10 centimeters in length, and are round, broad, flat, and connected to a central, slender stem. The smooth leaves resemble miniature lily pads and are dark green with a few small, light green veins that branch out from the center. The stems are also light green and are pliable and thin. Petite® Nasturtium leaves are crisp, tender, and initially sweet tasting with a green, tangy flavor that transitions into pepper and mild spice. Petite® Nasturtium leaves are available year-round. Petite® Nasturtiums are the young, edible leaves of the herbaceous flowering plant and are a part of a trademarked line of specialty greens grown by Fresh Origins Farm in San Diego, California. Designed to be slightly larger than microgreens, Petite® Nasturtiums are harvested 4-6 weeks after sowing and are tender and delicate. The name nasturtium comes from the Latin words for nose (nas), and twist (tortum), which essentially translates to “twisted nose.” Many believe the plant was named for the reaction on a person’s face after biting into the peppery, bittersweet leaves. 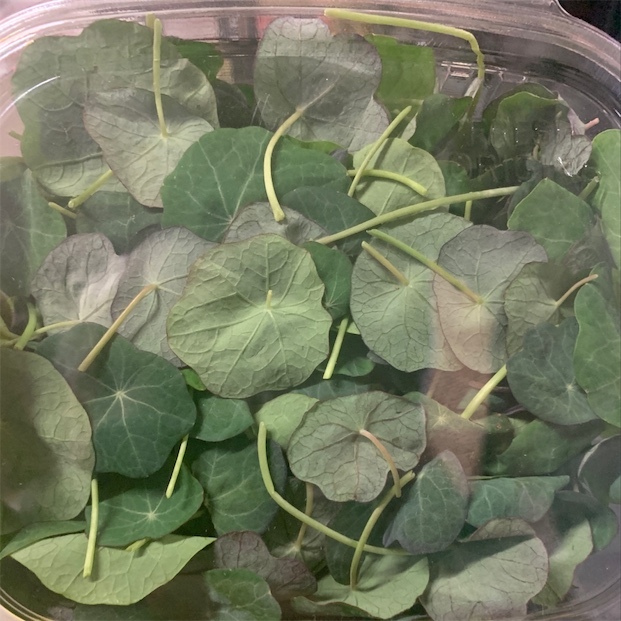 Today Petite® Nasturtium leaves are used similarly to the mature leaves by chefs and home cooks for their peppery bite and unusual round shape. Petite® Nasturtium leaves are high in vitamin C and also contain iron, vitamins A and D, beta-carotene, flavonoids, and manganese. Petite® Nasturtium leaves are best suited for raw applications as they can add a spicy or peppery flavor and unusual round shape to culinary dishes. The delicate nature of the leaves cannot withstand high heat preparations and are preferred to be used fresh as an edible garnish. Petite® Nasturtium leaves can be placed in pasta, grain, and green salads, added to sandwiches and quesadillas, decorated over seafood such as fish, crab, and lobster, and served alongside meat dishes. They can also be blended into pesto, served on top of desserts, pastries, and sorbets, or served in cocktails. Petite® Nasturtium leaves pair well with honey, garlic, chives, onion, brie, tarragon, black mint, yogurt, baby beets, carrots, radishes, granny smith apples, sesame seed oil, and pine nuts. They will keep 7-10 days when stored unwashed, in a sealed container, and in the refrigerator. During the Victorian era, nasturtiums were used as a treatment for scurvy due to its high vitamin C content. The leaves were also used as a daily supplement to help fight against common colds and were planted in backyards to always have a supply on hand. In addition to medicinal use, the flowers and leaves also grew in popularity for their beauty because of Monet, the famous painter who often depicted nasturtiums in his painting of landscapes. Nasturtium varieties that are found today are descendent of two species native to Peru on the Western coast of South America. These species found their way to Europe via Spanish conquistadors and the long trailing vines that we are familiar with today were developed by a Danish botanist. Nasturtiums were seen in the United States as early as 1759 and were planted in Thomas Jefferson’s Monticello garden. Petite® Nasturtiums were created by Fresh Origins Farm in San Diego, California in the 1990s-2000s. Today Petite® Nasturtiums can be found through select partners of Fresh Origins, such as Specialty Produce, and are available across the United States. 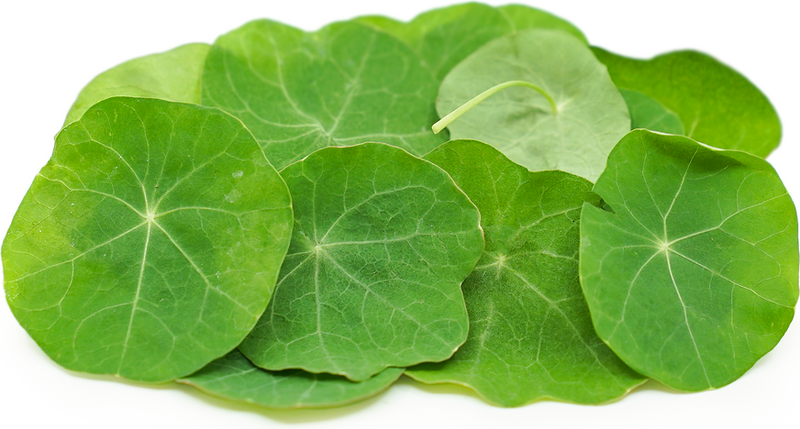 Recipes that include Petite® Nasturtium Leaf. One is easiest, three is harder. Someone shared Petite® Nasturtium Leaf using the Specialty Produce app for iPhone and Android.